It was pitty that I did not see any painting and calligraphy in Taipei Palace Museum this time as they were closed those sections. However I saw a qin book. 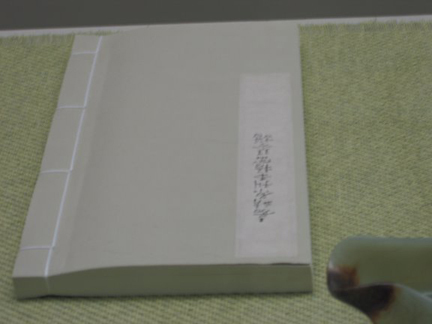 Jia-jing Yuan Kan Ben Wu-Gang Qinpu (嘉靖原刊本梧岡琴譜) but was not sure if it is a Guqin notation book then. 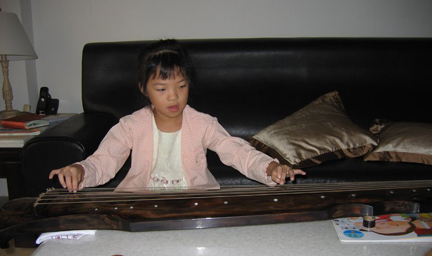 I took these 2 photos and after came back to the US, I looked at Zha Fu-xi's Cun Jian Guqin Qupu Jilan 查阜西之存見古琴曲譜輯覽 and am pretty sure that it is the Qin Pu that Zha did not put it in Cun Jian Guqin Qupu Jilan, as all the materials in this qin book are in Qinpu Zhenchuan 琴譜正傳, which was published in 1547 Ming Dynasty Jia-jing year 26th to 40th. 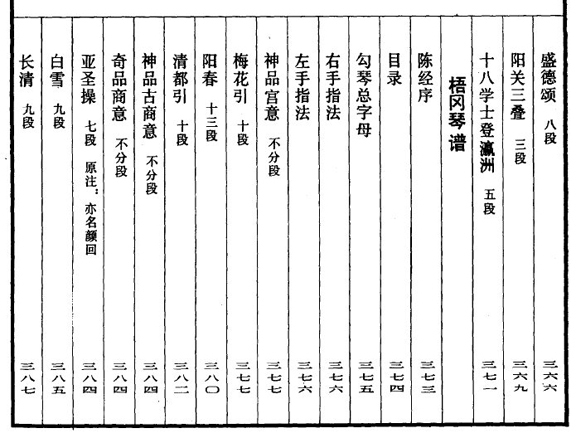 The editor of Qinpu Zhenchuan was Huang Xian 黃獻 also named Wu Gang 別號 梧岡. Qinpu Zhenchuan has 71 qin pieces including the 42 pieces from Wu-gang Qinpu. 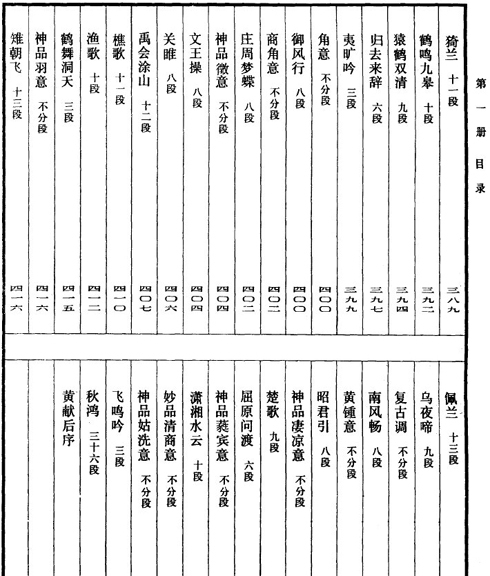 Below are the Wu Gang Qinpu's index from Qinqu Jichen 琴曲集成. My friend, Liu Shan-wei, loaned me his qin for 3 days. I carried it to my twin sister's home in Xin-chu to practice. Sophia's home is more quiet than father's home. I can really feel the qin quality and its personality. This is the first qin made by Shan-wei. He spent one year and 4 months to finish it. Mr. Lin Li-zhen 林立正 is his teacher. 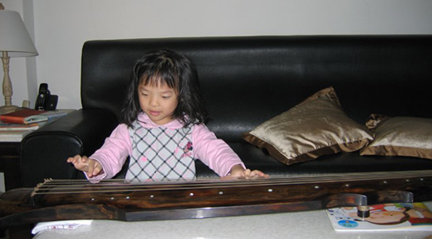 Shan-wei first learned qin playing and qin making from Mr. Chen Hui-de 程惠德 2 years ago. 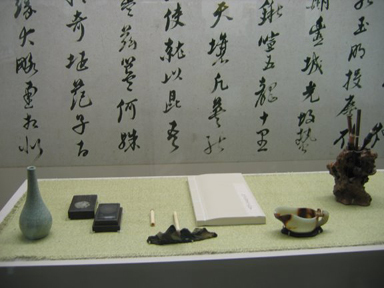 The first qin he made was supervised by Master Lin Li-zhen. The upper board is Shan wood 杉木 (China fir) and the bottom wood is Zhang wood 樟木 (champhorwood). The form of this qin is Fu Xi Style 伏羲式. According to Shan-wei, Master Lin only make two kinds of qin form, Zhong Ni Style 仲尼式 and Fu Xi Style. I like this qin a lot. The high tone is so beautiful and the lacquer work has a very natural appearance. Since I had a qin with me, I let Sophia's daughters try to play it. I did not really teach them how to play but they saw my playing and therefore, when they sit in front of the qin, they knew how to position their little hands. I wish I can teach them. I am very glad that I took these photos.